Borussia Dortmund’s coronation as German champion is now very much in doubt. Bayern Munich scored twice inside of 11 minutes and took apart Borussia Monchengladbach 5-1 on the road, drawing level with Dortmund atop the Bundesliga table in the process. Dortmund remains ahead on goal differential, but the sides are headed firmly in opposite directions. BVB has been in first place since the end of September but now failed to win four of its last five league matches, including a 2-1 setback against lowly Augsburg on Friday. Bayern, meanwhile, has now won 11 of 12 since the start of December. And this one was arguably the most impressive. Thomas Muller punched home a ball in by Serge Gnabry nine minutes later to double the lead, though Lars Stindl pulled one back for Gladbach in the 37th minute. Gnabry added the fourth 15 minutes from time, and Lewandowski converted a penalty kick in what amounted to the last kick of the match. United States international Fabian Johnson started on the bench for Gladbach and replaced Michael Lang in the 76th minute. 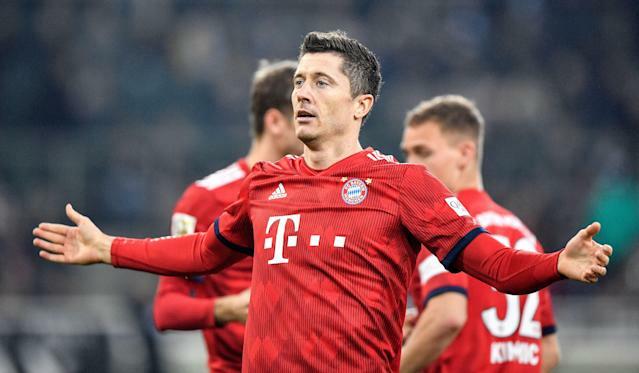 Lewandowski’s brace means he is now tied with Claudio Pizarro as the top foreign-born scorer in Bundesliga history, as both men have 195 goals. More directly, it means Bayern’s chief weapon is in form, and a record-extending seventh straight Bundesliga crown is in sight. Ten matches remain in the league this season, with Der Klassiker set to take place on April 6 at the Allianz Arena. That match won’t necessarily decide the title. Bayern is doing a great job of that right now all on its own.